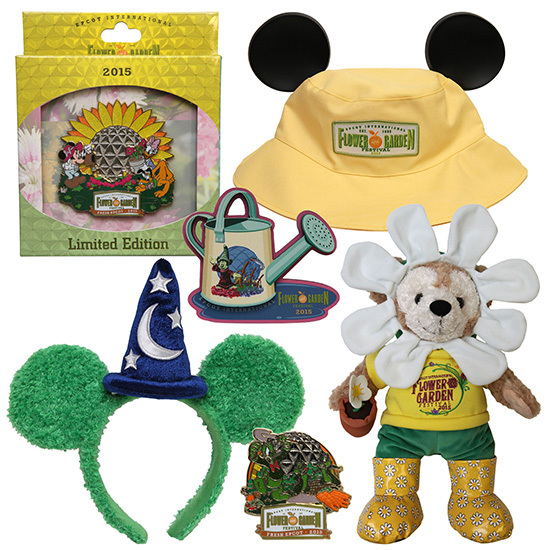 The 2015 Epcot Flower and Garden Festival starts March 4 and Disney is giving guests a sneak peek at some of the new merchandise for this year. The new items include apparel, drinkware, accessories, pins, and more. Guests can find the Flower and Garden Festival merchandise at the Festival Center located between Mission:SPACE and the Universe of Energy. A new set of Mickey Mouse ears in grassy green with the Sorcerer’s Hat will be available in addition to a new Duffy the Disney Bear featuring a daisy-like head cover and gardening boots. The main logo of the festival features a Sorcerer Mickey topiary and it’ll be featured on a coffee mug, magnet, and tote bag. Pin collectors will find limited edition pins with the festival’s topiaries including the new Anna and Elsa topiaries. Speaking of Frozen, Olaf will be featured on new garden statues including a rain gauge. Dooney & Bourke fans will be excited to see the new black and white design that is debuting at the festival. The black and white pattern designed by Disney Design Group artist Paola Gutierrez features silhouettes of Disney characters riding vintage bicycles. The bags released during the festival will also feature a special hangtag. Other merchandise items to be announced at a later day may include a retail MagicBand and possibly a new Disney Vera Bradley design. We’ll keep you posted!